Thailand is not known for its vegetarian fare, but getting meatless foods there is much easier than you might think. Amid the ubiquitous chicken, fish and tiger prawn entrees is a host of vegetarian opportunities waiting to be discovered. In addition, the food in Thailand is very adaptable for different tastes, flavors and dietary needs. Truth be told, most of Thailand is a relatively easy stepping stone into vegetarian Asia. The Thai beaches, countryside and of course its cities are frequently visited by Westerners who bring their diets with them. Bangkok especially is a very cosmopolitan city, and while it is not anything exactly like a Western city, many of the amenities cross the cultural barrier. 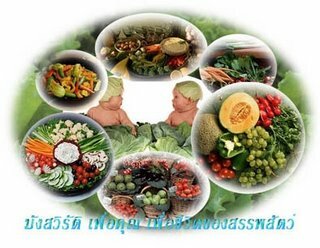 Lots of people assume that since Thailand is mostly Buddhist that vegetarianism is common among the people. However, Theravada Buddhism does not prohibit or even discourage the eating of meat except as a voluntary ascetic practice. Chicken, fish and eggs are all very common main ingredients in many dishes. While it is possible to keep a vegetarian diet almost anywhere in Thailand, some restaurants are more accommodating than others. Safe bets for vegetarian fare include Indian and Chinese restaurants and noodle shops. The Indian places have to keep veggie options for their Hindu clientele, just as Chinese restaurants have to satisfy their Chinese Buddhist customers. Noodle shops are especially good because everything is made fresh, so you can specify which ingredients to include or omit from a dish. These restaurants typically have condiments on the table, including fish sauce. This leads me to believe that fish sauce is not part of the recipe for most noodle dishes. Fish and oyster sauce are common ingredients and condiments in Thailand and may be difficult to avoid completely. To be sure that you do not eat these products you can request that they not be used. The food section of a translation book should have words for many of the foods you will encounter. Venues to avoid include street vendors. These portable restaurants, many setting up as the sun goes down in night markets, are not known for their cleanliness and rarely make custom dishes to the diners’ requests. Most street vendors actually cook food at a different location and simply keep it warm in their pushcarts or on their portable grills. While travelers can get by in most situations with broken Thai and creative pantomime, these communication tactics leave something to be desired when discussing more complicated things such as dietary restrictions. Having a good knowledge ahead of time about how to ask for what you need is key to keeping your diet. Most phrasebooks worth their salt will have a section dedicated to food and list some way to ask for food without meat. One phrase that works well is pom kin tae pak, which means literally, “I eat only vegetables.” Women say dee chan instead of pom. Usually this phrase works fine. While in Thailand recently I was able to use this phrase very successfully. The few times I got confused looks, resorting to the listing method of saying no beef, no shrimp, no chicken, etc. conveyed the message adequately to the wait staff. The confusion comes from Thai not having a single word that means vegetarian. Thus, different guidebooks will offer different translations and different people will understand the phrases in different ways. Almost all ways of saying that you are a vegetarian will need some explanation. In addition, Thai has five tones, making it a difficult language for novices to use and understand. Another phrase that works well is to use the word tae, meaning vegetable, after a dish name. You might ask for Pad Thai tae or Radna tae. This is similar to requesting vegetable fried noodles as opposed to chicken or shrimp fried noodles in the West. The assumption is that the vegetables and sometimes tofu will take the place of any meat. For vegans to keep their diets should not be much more difficult than for lacto-ovo vegetarians. Most Vegetarian Thai cooking does not make use of dairy products. On top of this, it is as easy to request no eggs as it is to request no meat. I was really lucky when i went to thailand because one of the guys i was with spoke Thai almost fluenty. He helped me out A LOT. Personally, I love tofu tom ka! I found it a bit very difficult to be vegan.. i ate a lot of eggs there as my source of protein. would go back in a heart beat! !